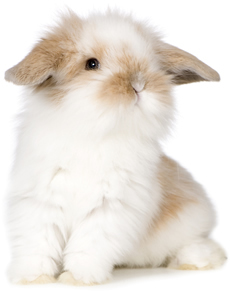 Many small animals get hairballs, including rabbits, cats, guinea pigs, and others. But the composition of a hairball, the proper diagnosis, and treatment of hairballs are different for each animal. Cats are notorious for hairballs which pass through or are gagged out. Many vets recommend a cat laxative. Rabbits and other herbivores should never be given laxatives under any circumstance. Unlike a cat hairball, which is predominately comprised of hair from grooming, a rabbit “hairball” may also include pieces of pellets, hay, and other things that it ingested. Rabbits do not have the ability to vomit & expel this mass. Small or runny droppings are a sign of improper digestion and a possible ‘hairball’. Rabbit owners should be concerned if their pets have not pooed in 24 hours. “Hairballs” or wool blocks are commonly diagnosed. A growing number of veterinarians who treat rabbits now understand that the accumulation of hair and food in the stomach of a rabbit is a secondary problem. The main cause is the slowing of the gastrointestinal tract. Rabbits require a diet very high in indigestible fibre. Diets higher in indigestible fibre move through the digestive tract at a faster pace and encourage both a continual need to poo & a constant desire to eat. Rabbits and other grazers should consume grass hay throughout the day, encouraging healthy GI tract movement. Diets lower in indigestible fibre lead to a slower movement of food through the digestive tract. When the tract slows, food remains in place, and the rabbit has the feeling of being full. By choosing to not eat, their digestive system continues to slow. This potentially life-threatening condition is the commonly feared GI Stasis (no eating, no pooing, & no digesting). Fortunately, the vast majority of GIT motility-related incidents can be avoided through proper diet and regular observation. The healthiest lifelong diet often consists of a constant supply of fresh water and a measured amount of High Fibre (+ 22%) quality pellets (Oxbow’s Rabbit Food), unlimited amounts of grass hay (such as Oxbow’s Western Timothy, Botanical, Orchard Grass) and a small amount of other foods can be given as treats such as appropriate herbs & greens and minimal amounts of vegetables, fruit. A rabbit given a measured amount of pellets should also consume nearly his body size in hay each day. Changes in the diet can mean changes in GIT motility, so maintain a consistent diet with little product variation. Note: Lactobacillus or Acidophillus bacteria are not present in significant amounts in a rabbit’s caecum. Yogurt and other probiotics marketed for pets are often high in calories and sugar. Sugars feed detrimental Clostridium bacteria and can lead to gas, lack of appetite, and GIT slowdown. Oxbow’s Critical Care for Herbivores(TM) (high fibre, assisted feeding formula) is often your vet’s first treatment tool in these circumstances to quickly get the digestive system moving again. Rabbits and other herbivores should never be given laxatives under any circumstance. The clinical presentations of “hairballs” in different species stem from very different causes, and rabbits should not be treated with products intended for cats. Laxatives intended for dogs and cats do an injustice to a rabbit’s unique digestive tract. Dangers include: abdominal cramping, gas and bloating, chemical imbalances in the blood due to a pH imbalance, and loss of salt and minerals due to diarrhea. The loss of minerals can seriously disrupt the body’s electrolyte balance and lead to severe dehydration. Oil-based laxatives coat the intestinal wall and can impair vitamin absorption. The oily laxatives coat the mass of hair and food and make it resistant to water. Water absorption is critical to break down and separate the mass to particle sizes the rabbit can pass. Rabbits instinctively hide pain, and owners often notice a decrease in appetite after giving laxatives. Gas and abdominal pain further complicate the initial problem of a slowing GIT and without the intake of grass hay (fibre), the tract stops. Once GI stasis occurs, seek veterinary care immediately.